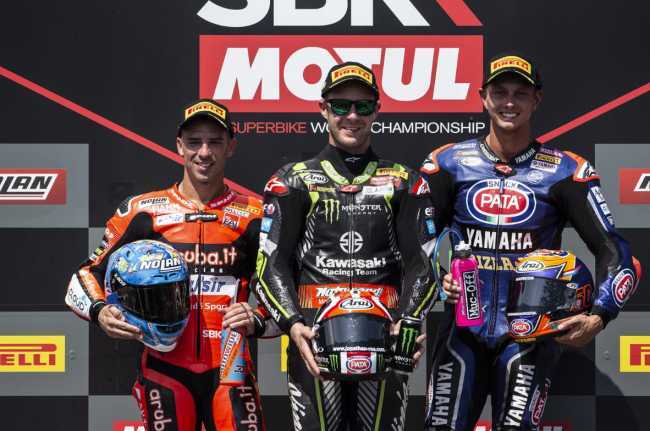 In scoring his 11th WorldSBK race win of the season Jonathan Rea (KRT) reached a career total of 65 victories - and a historic 50th race win since he joined Kawasaki in 2015. Tom Sykes (KRT) finished fifth after a hot race held over 20 laps of the Portimao circuit. After an intense Superpole 2 qualifying session Rea started the first race of the Portimao weekend from the front row and second place while Sykes was sixth, making a second row start. Rea made fast early progress and led every lap of the race, increasing his lead and then easing up to celebrate his latest win at Portimao. He has now taken six career wins at the 4.592km circuit near the Algarve coast, all in succession. On lap three Rea set a new lap record of 1’42.304, in ambient temperatures that reached almost 30°C. Sykes was fourth on lap one but dropped to sixth one lap later. He remained in that position for much of the early race, until he was promoted to the top five, nine laps from the end. Rea now leads the championship by a strong 104 points, as his closest rival, Chaz Davies, placed fourth in today’s opening race. Sykes is still fourth overall and both KRT riders have one more chance to shine in the Portuguese sun in race two on Sunday the 16th of September, at 15.15 local time. Toprak Razgatlioglu (Kawasaki Puccetti Racing) continued the Ninja ZX-10RR success in race one as the top independent rider, in eighth place, after qualifying tenth in Superpole. Leandro Mercado (Orelac Racing VerdNatura Kawasaki) was a battling 11th today. Yonny Hernandez (Team Pedercini Racing Kawasaki) placed 12th and Roman Ramos (Team GoEleven Kawasaki) 14th.